Yu Zhu tried to muffle her scream, biting on a damp cloth as Zhuo Hao sewed the skin on her shoulder back together in the dim candle light. His grey clothes were soaked with blood and his mask lay forgotten in a corner of the room. There were still a few hours before dawn, if she screamed now, the neighbors would wake. The door opened and Lin Yu rushed in, the smile on her face dropping as she saw the bloody rags piled around Yu Zhu. “Move” She said brusquely, her eyes began to glow as green fire sprouted from her hands. Zhuo Hao didn’t need to be told twice and backed away. This wasn’t like the normal powers of well practiced martial artists. This was something he had never seen before. But Yu Zhu grabbed Lin Yu’s arm with her good hand, her fingers digging into Lin Yu’s arm in panic. “Who did this?” Lin Yu asked, her face a mask of rage, “I’m going to bury him in his family plot.” Zhuo Hao fumbled the towel he was holding, neither of the girls noticed. Zhuo Hao walked forward with a sleeping draught, “Rest, my team should’ve taken care of the gold already.” Yu Zhu drank down the vial gratefully and fell into a dreamless sleep. She was covered in sweat as she looked at Zhuo Hao with annoyance, “Three of my men strained their backs moving the gold. The others nearly fainted in exhaustion. I caught four trying to stuff gold down their drawers.” She grimaced at the last one, they were all thieves by trade, seeing the gold nearly made their mouths water. Some of them outright drooled. Pei, Zhuo Hao’s second in command, gestured to the three others behind them, all in grey, “We’ve all been here since Yu Zhu and Master got back.” Lin Yu looked around and called to them softly, “Min, Ran, Tong. You’re all here!” The three men smiled at her brightly as she went to talk with them. Pei’s eyebrows furrowed as she gave up, “Like always. I’ll handle it.” She walked away, exasperated, it seemed like she was always more worried about her easygoing Thief Lord than he was about himself. Pei smiled at Lin Yu as she gestured for the thieves to follow her out of Yu Zhu’s place, “I’ve heard your dance can make the gods fall in love. Perhaps sometime you can show us.” She patted Lin Yu’s shoulder as she and the others disappeared into the oncoming dawn. “She cares deeply about you.” Zhuo Hao said gently, “And she’s doesn’t care for people easily.” Lin Yu looked at him, startled at how clearly he understood Yu Zhu. “But I can handle it. I’m thousands of years older.” Lin Yu said petulantly. 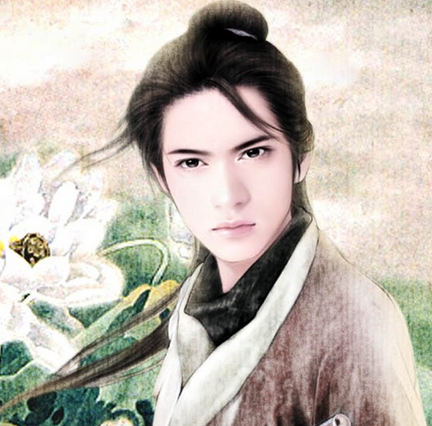 Zhuo Hao said nothing, he merely smiled sadly, remembering how Zhan Ye use to plead with him when he went to the borders to fight, Zhan Ye use to think Zhuo Hao was overprotective too. They were brothers through thick and thin, Zhuo Hao remembered Zhan Ye’s eyes, as Zhuo Hao was taken out of the palace in chains. That was the day his brother grew up. Now they would be facing each other on opposite sides of this battle, neither could win without losing. That jolted out him out of his brooding thoughts. For a horrifying moment he thought Lin Yu knew everything. Zhuo Hao actually smiled, compared to what he was thinking, this was nothing. “Why should I run?” He twisted a piece of grass in his fingers as he waited for her explanation, his eyes looking at her with an expression that made Lin Yu want to turn towards and away from him at the same time. For a moment, the ghosts of his past seem overshadow to his face, Lin Yu covered his hand with her, bringing him back to the present. His lips turned upwards into a boyish grin, “You laugh too freely, run too wildly, and dance too beautifully to be a monster.” She looked his warm fingers gripping her hand, the feeling was making her slightly giddy, “But I’m not human.” She mumbled. “I couldn’t care if you were a pig, rat, spider or snake.” He answered teasingly, still hand on hers. The young girl swallowed and whispered, “Lu Xi.” She flinched as Bao Lu came close with some tea, the servant gently set the cup down beside her, she had her hands up as if she was expecting to be hit. Zhu Zhan Ye watched her interaction carefully, without saying anything, but there was pity in his eyes. Lu Xi’s eyes watered, “Parents needed money. Sold me.” Zhu Zhan Ye sighed, he had seen this often when he fought in the army. Refugees offering their youngest daughters and sons in exchange for money to feed the rest of the brood. “Did you see what that person looked like?” Bao Lu asked hurriedly. Zhu Zhan Ye threw a curious look at the eager servant. “I…only heard a voice.” she looked down, “It was muffled and I don’t know…” She grew frightened and pleaded, “Please don’t send me back to that horrible old man, I’ll do anything. I’ll wash clothes, I’ll carry things. Just please.” Her eyes were over bright and her voice was thick with unadulterated fear. He and Bao Lu left the room. Zhan Ye made it down the stairs before he punched a pillar, leaving the imprint of his fist in the wood. “It doesn’t seem like the Midnight Thief was trying to do some good.” Bao Lu murmured. Lin Yu smiled and shook her head, “I told Wu Ma to make it.” The kind motherly street vendor had send over a dozen of her best meat buns and stew. “How are you feeling?” Lin Yu asked as she placed a spoon in Yu Zhu’s good hand. “I’ve had better days.” Yu Zhu sighed as she sipped gratefully. Her face was pale and her lips were cracked, but she smiled for Lin Yu’s benefit. There was a knocking sound at the door. Lin Yu ran to see who it was. Lin Yu nearly broke the door handle as she glared at him, “It can wait.” She was about to slam the door in his face when Yu Zhu put a weak hand on the wood. She had a thick robe over her clothes, though she was pale, she straightened with a look of iron will. Lin Yu was always amazed at Yu Zhu’s ability to suppress whatever pain or anger she felt. She had seen it happen when Yu Zhu was a little girl in the demon village, there was a calm air of elegance and grace to her even when she was covered in mud. It was as if she stood above the world, never letting anything affect her. Zhu Zhan Ye had the grace to look taken aback, two faintly pink spots appeared on his cheeks. “ah.. well….” Behind him, the little girl peeked out. Yu Zhu recognized the little girl instantly, she leaned down and smiled kindly, “Hello, little one.” The little girl blinked and looked down. “That’s a surprise.” Lin Yu snapped acidly. Lu Xi had looked at Yu Zhu with curiosity every since she had appeared. There was something familiar about her. And when Yu Zhu spoke, Lu Xi blinked. Her voice, it sounded so familiar… where had she heard it before? Yu Zhu looked at the child, she might remember. I have to get her away from Zhu Zhan Ye before she says anything. Zhu Zhan Ye was relieved, the tension from him was gone as he grinned. Yu Zhu couldn’t help but admire that smile, there was something pleasing about Zhu Zhan Ye when he smiled like that. Her sensible self admonished silently, he’s still the enemy. Zhu Zhan Ye nodded, the light in his eyes changed, and before Lin Yu could stop him, he gripped Yu Zhu’s injured shoulder and squeezed. To a normal person, it would look as if Zhu Zhan Ye was touching Yu Zhu’s shoulder in thanks. Yu Zhu gritted her teeth as she smiled even more serenely as she felt the bandage dig into her wound. They looked at each other for an electrifying moment, neither seemed to give way to the pressure in the other’s eyes. “Master Zhan, what are you doing?” She asked like a proper bred lady. Her voice was politely inquisitive, as if they both knew he had committed nothing more than a social blunder. Yu Zhu’s smile was still cold, she could feel the icy sweat from pain form on the nape of her neck. Just a few more moments, she told herself, and then I can collapse. Zhu Zhan Ye bowed on last time before he left. Yu Zhu bowed as well, her hidden hands shaking from the pain. He had squeezed hard enough to break open the wound. Once she was back in her room with the doors closed tightly behind her, Yu Zhu collapsed in pain. “Curse the rotten scoundrel” She whispered as Lin Yu ran in after her. “I look forward to beating him to a pulp.” Lin Yu muttered. Hua Er, Shan Ying Lang, and Doctor Li arrived in Ning City unannounced. They were in common traveler’s clothes, with wide brimmed hats covering their faces. The city lay before them like a vast forest of streets, crawling in all directions. “It’s as big as the capital.” Doctor Li breathed, watching the crush of humanity rushed around them. Of course she knew. They had sent word that they had been attacked to the King of Yue. The King of Yue had replied they would find shelter in Ning City, the they were to wait until he and Xu Long Hui could root out the assassins. “What’s the person we’re suppose to be looking for?” Hua Er muttered as they scanned the vast city that lay before them. The Clan of the Dog was one of the powerful family of the Zodiac, rivaling the Jade Rabbit’s power at the height of the wars hundreds of eons ago. While time had whittled at way its former glory, the clan still had serious clout. The man they called the Wolf Chieftain had taken command of clan forty thousand years ago and created the formidable Red Wolf army. His home was at the edge icy mountains where the monster the demons feared was born. Legend was that anyone who went into the tallest peak would die from a curse Wei Yun had placed there. The Wolf Chieftain stared at the Grey mountains as he stroked his beard, “there’s something out there.” He whispered, his ears would never fail him. He had returned home to ready supplies for the trip, but tonight, on the full moon, he was sure that something, or someone was in the mountains. Aww thank you! What a lovely present. As always, Yu Zhu and ZZY’s interaction makes my heart race. He’s kind at heart, but has a duty that he cannot turn away from. I guess that’s what it is to face your fate. But at times I wonder even when he might suspect, if he’s drawn to YZ just as she is drawn to him. It’s like a competition of sorts where they have this weird push and pull, a battle of the minds. Though I also think he’s a bit attracted to her as well as a man is to a woman. She is mysterious and he so wants to figure her out. I cannot fathom what might happen if Huang Wu is released and saved so soon. The poor guy. My heart hurts for him, as it does for Wei Yun as well. I can imagine war breaking out everywhere! As you start unmasking Zhuo Hao, he’s getting more interesting. It makes me a little sad that the brothers are enemies. I like how there are openly known battles and then there are internal struggles. But both brothers have picked their path. Can ZZY turn his back on his father and kingdom just like his brother? Zhuo Hao and ZZY (I like this abrev) were seriously close once upon a time. They’re kind of brothers that saw each other through thick and thin. But being born of imperial house means that you can’t really see family as family, all ties are corrupted by power. They’re family’s pretty screwed up. As for Huang Wu, he lost his powers last chapter and I’m writing for him as we speak. He’s def. a man on a mission now. I like Yu ZHu and ZZY’s time together too. They’re basically having mental chess. And both being raised in unusual circumstances, are pretty evenly matched. ZZY’s curious by nature and he’s never met a girl like YZ before! Oh and I can’t wait for Yu Zhu and Hua Er to cross paths!!! Right? it’s been too long. My fault of course, but YZ really needed this time to grow into her own. “You couldn’t keep me away if you tried.” – Awww *swoon* is this Zhuo Hao’s love declaration? Looks like Zhu Zhan Ye has his suspicion on Yu Zhu being the Midnight thief. Thank you for the chapter! Definitely quench my thirst for the time being. Ahaha I’m glad! The next chapter’s a bit more Zhuo hao centric than I had originally intended but he’s more than just a thief lord and I really liked his interactions with Lin Yu. I just haven’t gotten an opportunity to write more yet! Thank you so much! I’m so glad you and the others enjoy the story! one knows talents when one sees talent hohoho. omg you got plan for a sequel already? *gasp* I’ll plenty to read for sure then. ahahah I bow down to your expertise. I actually really enjoy reading the chapters and updates on your blog! It’s a sequel/spin-off. Still slightly an idea right now but I’m gonna focus on this one and develop the other one on the side. I have to sleep now otherwise i will go to work tomorrow a monster. Have a good night and enjoy chapt 40! I had no idea you were reading the chapters on my blog hahaha. Yes I shall go read chapter 20 and input my thoughts. opps I mean 40*** I got too excited. Ahahah I totally LOLed. Have a good night! Ahaha I just wrote the next chapter, and don’t worry. The Crow’s definitely coming up, if not the next chapter than the one after. No pressure of course. And also, although Zhuo Hao is okay, I’d like her to end up with Huang Wu instead. Not only because they are both demon, I just like their interactions better. And the princess, I still want her to end up with Wei Yun inspite of everything. I think Lin Yu’s pretty confused when it comes to boys. She’s got it good though, cuz both of them are pretty set on her being one and only. As for the princess, she and Wei Yun have so much to discuss. I’m glad for the feedback though, and while I can’t speak about the ending, it’s good to know! Thanks so much for the chapter!! For future chapters can u go back to using pictures of real life actors and actresses that u wanted to be casted for each character again instead of the drawing you have been using recently. No prob! I really like the paintings and occasionally I will switch it up to real pictures I promise! Thanks for reading! Yay! Finally, the whole gang will reunite! Oh my, I haven’t been able to come onto your site and read for such a long time, and now I see all of this action happening! I makes me so giddy and excited. I absolutely love your writing style and the direction that the novel is taking. Best in a long time. Thank you very much for delivering much delight into my life.